Container to hold all of the parts. 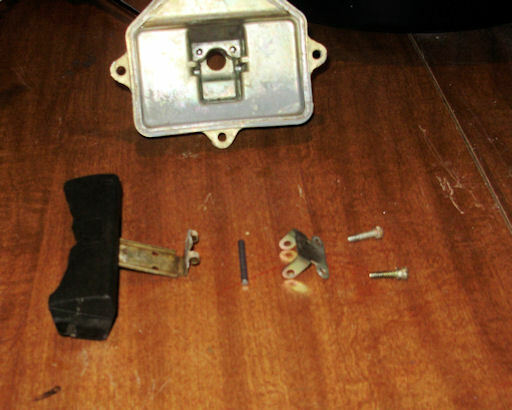 Note: These picture show the carburetor with the air cleaner stud attached. It is much easier to remove that using a large, flat bladed screw driver before proceeding any further. 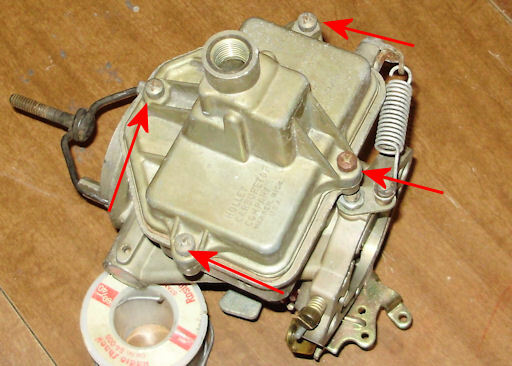 Yes, it will be difficult to remove but removing it now makes it easier to work on certain areas and with it remove, the main body will fit into a gallon container of carburetor cleaner. Start by removing the needle valve using the 5/8" box wrench. There is a metal gasket that may be stuck to the fuel bowl. Make sure to remove that as well and set them in your discard pile. Next, use a #2 Philips screw driver to remove the 4 fuel bowl screws (red arrows point to the screws). Note: If it has been a long time since the last rebuild, these screws can be very difficult to remove. 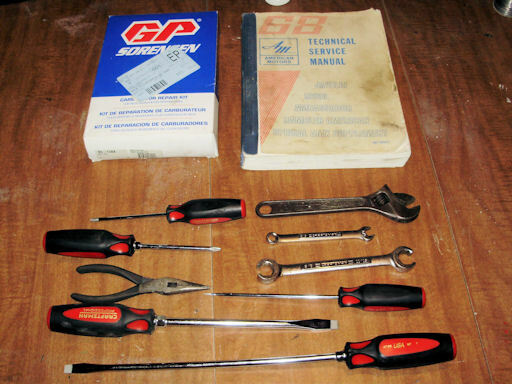 Make sure your screw driver is in good shape before starting and take your time. If needed, you can spray some penetrating oil on them from the main body side. 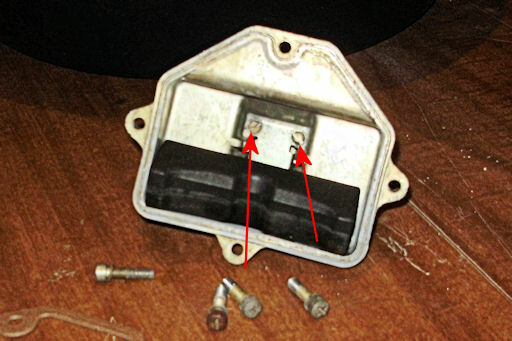 Once the screws are out, remove the fuel bowl cover. It will probably be hard to remove but resist the temptation to pry between the main body and screw bosses in the cover. Doing so will likely warp the cover resulting in a major fuel leak. Tapping on the cover with a plastic hammer (or the handle of a heavy screw driver) will break the cover loose without warping it. Remove the gasket and place it in your discard pile. Use the 3/16" flat blade screw driver to remove the float retainer screws from the cover (red arrows point to screws). Gently remove the screws, float, and retainer bracket from the cover. Note: You may need to shake the cover over your parts container to remove them from the cover. Warning! New floats are not readily available. Be very, very careful with yours.